Nikolai Astrup (1880–1928), Sandalstrand (1927), oil over linocut and woodcut on board, 47 x 54 cm, Bergen Kunstmuseum, KODE, Bergen, Norway. The Athenaeum. 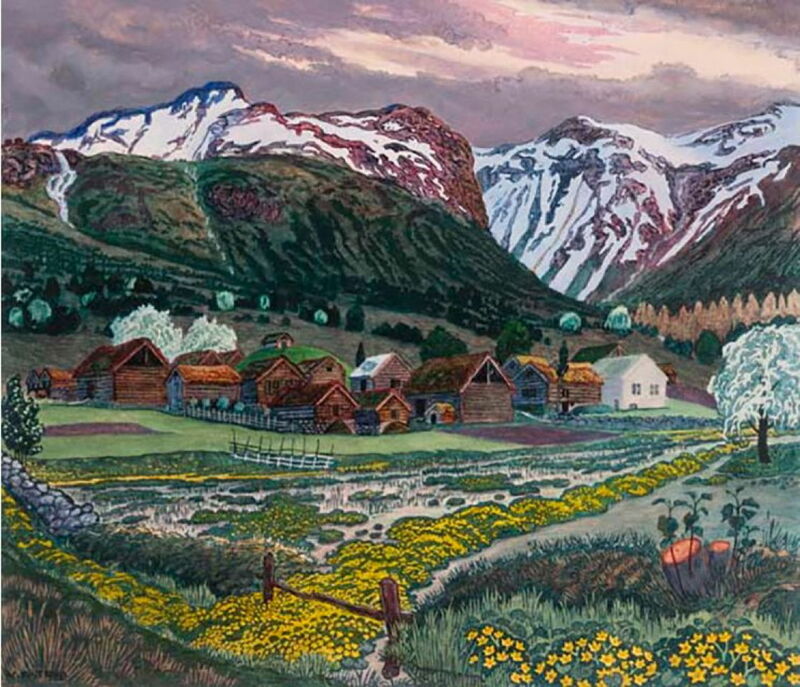 By 1925, Nikolai Astrup had recovered from his depression and frustrations of five years earlier, and was painting and making prints avidly in the family’s smallholding at Sandalstrand, on the southern shore of Jølster Lake in western Norway. Although spending the winter in North Africa in 1922-23 had helped his health for a while, he still suffered frequent chest problems and was far from being well. For much of his career, Astrup’s prints and paintings had informed and influenced one another; The Befring Mountain Farms (c 1924-28) is an example of his mixing the media in a single work, coupling woodblock printing with oil painting. It shows an extended series of farm buildings not far from Jølster Lake. Astrup uses the natural environment to generate one of his most magical works. Two people are engaged in milking a goat by the entrance to a building in the left foreground. The farm buildings have turf roofs with luxuriant growth, in one case sporting a small tree. Spindly birches stand next to them, their leaves shimmering in the light of the crescent moon. That moon is reflected in a small pond which is surrounded by marsh marigolds in full flower. You can hear the silence among the massive rock bluffs which tower over the lake, and that in the centre looks like the head of an owl, watching over the stillness of the night. 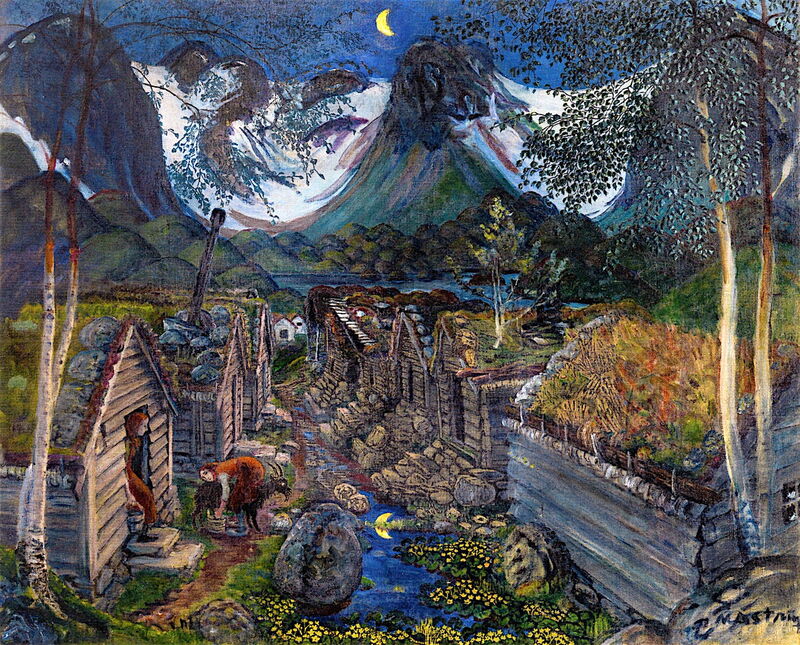 Nikolai Astrup (1880–1928), Two O’Clock on a June Night (c 1926), oil on canvas, 50 x 70 cm, location not known. The Athenaeum. 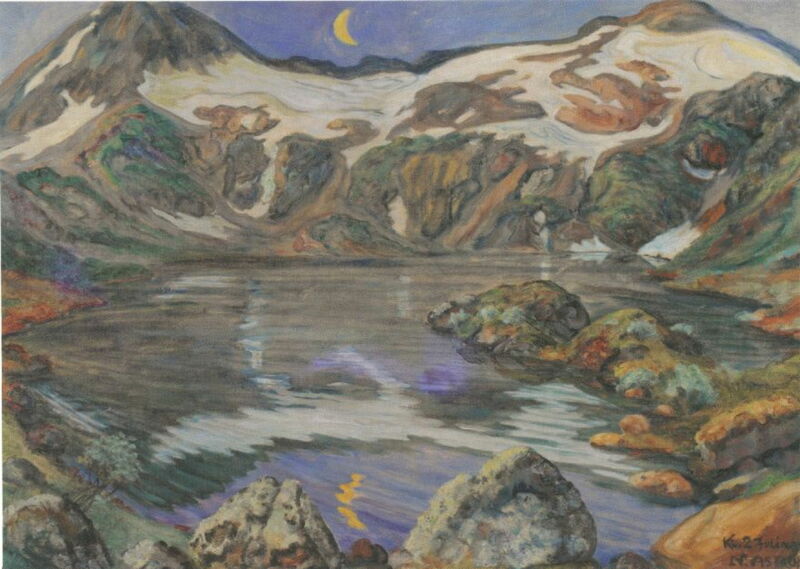 Another time, at Two O’Clock on a June Night (c 1926), Astrup shows a lake high in the hills, the same crescent moon shining in the sky. The surface of the water has fine ripples from the breeze which is blowing down from the snowfields above. These give that lake a fascinating texture, which contrasts with the surrounding craggy hills. 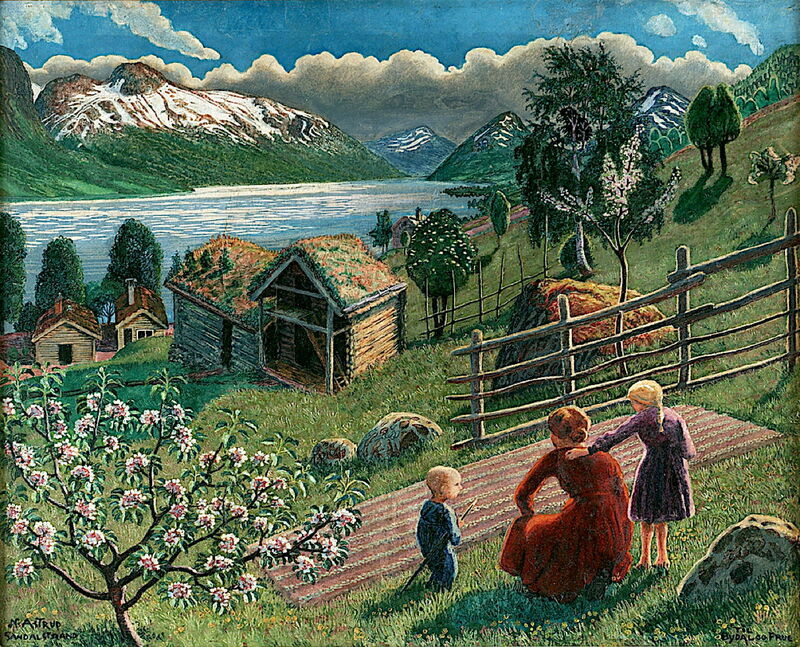 In 1926, Astrup exhibited again at the Bergen Art Association, and the last of the family’s eight children was born. Nikolai was delighted that his wife Engel still found time to become increasingly involved in the national arts and crafts movement, her speciality being textiles. Nikolai Astrup (1880–1928), Early Snow (1926-27), oil on canvas, 67 x 72 cm, Bergen Kunstmuseum, KODE, Bergen, Norway. The Athenaeum. Early Snow (1926-27) is a loose oil sketch of the beds at Sandalstrand after the first snowfall of the autumn. It has caught the Astrup family’s vegetables by surprise, with two large red cabbage plants looking the worse for the cold. The door to the house is open, revealing a traditional wood-burner blazing away to keep the occupants warm. The Astrups had clearly worked hard to develop their smallholding to support their family. Sandalstrand (1927) shows Engel and two of their children enjoying the summer sunshine, in partly-backlit conditions which surrounds their figures, trees, and fences with a magical aura. This too was created using mixed media, starting with a linocut and woodcut on board, over which Astrup painted in oils. It also underwent his characteristic evolution, starting as Growing Season Weather (c 1923), which was reversed and recomposed to a print of Growing Season at Sandalstrand (1925), and finally reworked as here, and dedicated to Trygve Bydal and his wife. 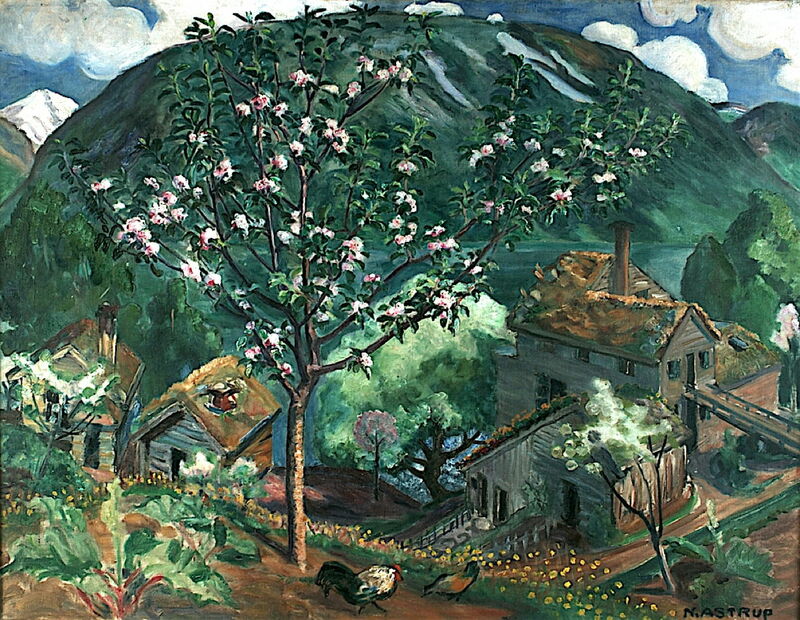 Nikolai Astrup (1880–1928), Apple Tree in Bloom (c 1927), oil on canvas, 78 x 100 cm, Bergen Kunstmuseum, KODE, Bergen, Norway. The Athenaeum. Apple Tree in Bloom (c 1927) shows a much more substantial if not industrial building, with the trees in full blossom and the marsh marigolds in flower. 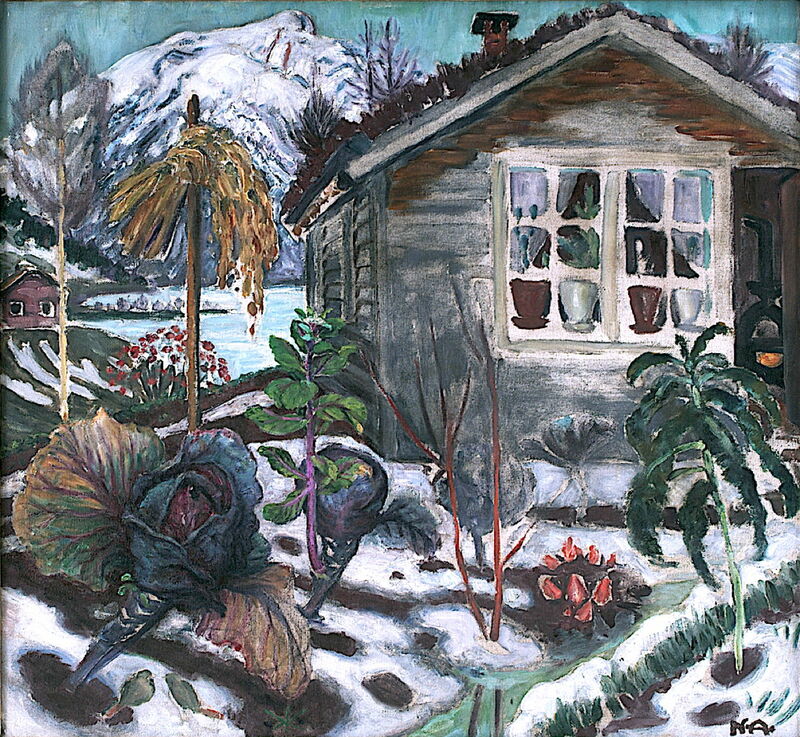 Nikolai Astrup (1880–1928), The Parsonage (c 1928), oil on canvas, 101 x 88 cm, Bergen Kunstmuseum, KODE, Bergen, Norway. The Athenaeum. The Parsonage (c 1928) presumably shows the replacement for the original building which was demolished in 1907, which Astrup had painted using a less extreme perspective projection in his The Shady Side of the Jølster Parsonage (before 1908). It continues to develop his theme of radical perspective in buildings, to which he had returned from time to time. Through the winter of 1927-28, Astrup’s pulmonary tuberculosis worsened. After Christmas, he developed pneumonia, and died of that on 21 January 1928, aged just forty-seven. His widow Engel went on to become a very successful textile designer, raised her eight children, and maintained their smallholding. She died thirty-eight years later, in 1966. 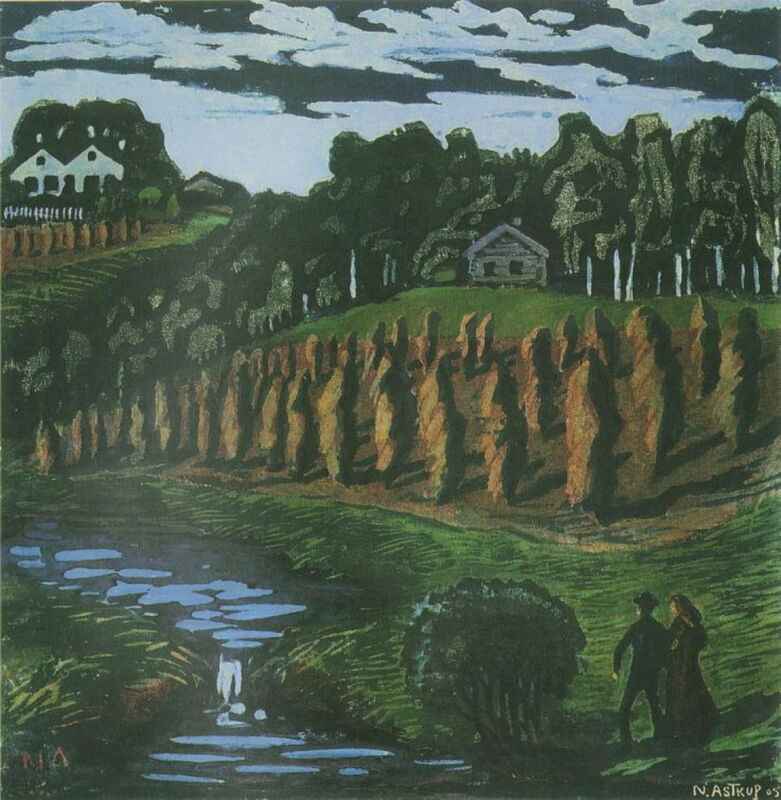 In 1986, their home at Astruptunet was opened as a museum, and between February 2016 and January 2017 a major exhibition of Nikolai Astrup’s paintings and prints was held in London, Norway, and Germany. Work is progressing on his catalogue raisonné, and many of his works are on show in Bergen and Oslo. The dating of Astrup’s paintings is often uncertain; that of his prints can be little more than intelligent guesswork. Here are a few which are believed to be from the period in which his colour woodcuts underwent their most dramatic development. Nikolai Astrup (1880–1928), Little Corn Stooks (c 1904), colour woodcut on paper, 19.6 x 19.7 cm, Nasjonalgalleriet, Oslo. Wikimedia Commons. Little Corn Stooks (c 1904) is an early exploration of this motif, when the cut corn was still becoming anthropomorphic, before his later paintings and prints of them. 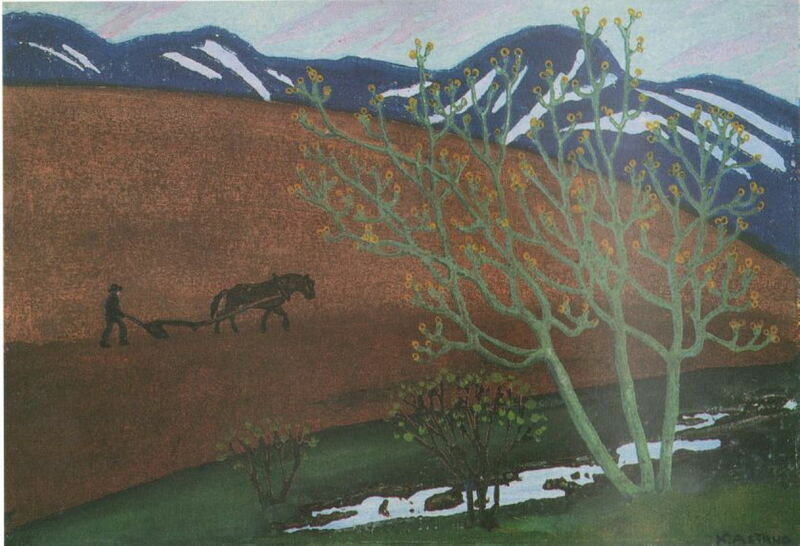 Nikolai Astrup (1880–1928), Night Ploughing (c 1905), colour woodcut on paper, 18.0 x 25.7 cm, Nasjonalgalleriet, Oslo. Wikimedia Commons. Night Ploughing (c 1905) shows a simpler motif in which he seems to have taken advantage of the texture of the paper for the soil. 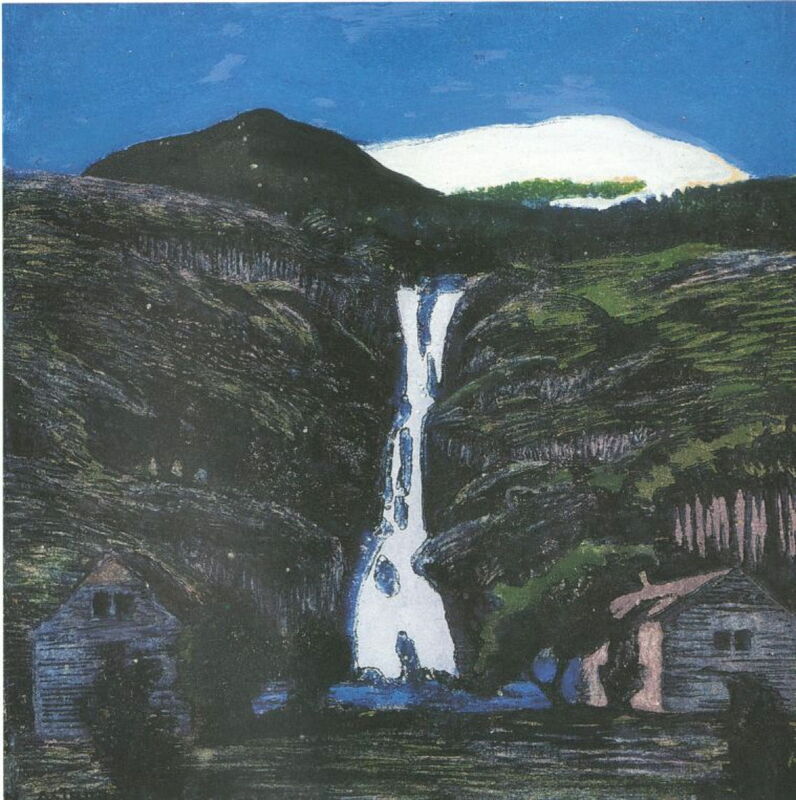 Nikolai Astrup (1880–1928), Waterfall and Glacier (c 1907), colour woodcut on paper, 15.2 x 15.5 cm, Nasjonalgalleriet, Oslo. Wikimedia Commons. Waterfall and Glacier (c 1907) contrasts the white water cascading down with its source in the ice-covered mountains above. 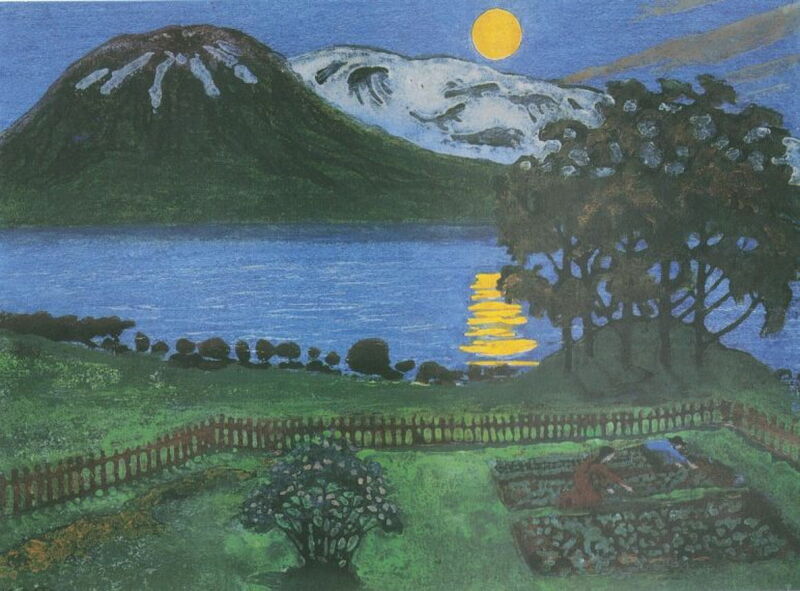 Nikolai Astrup (1880–1928), May Moon (c 1908), colour woodcut on paper, dimensions and location not known. Wikimedia Commons. 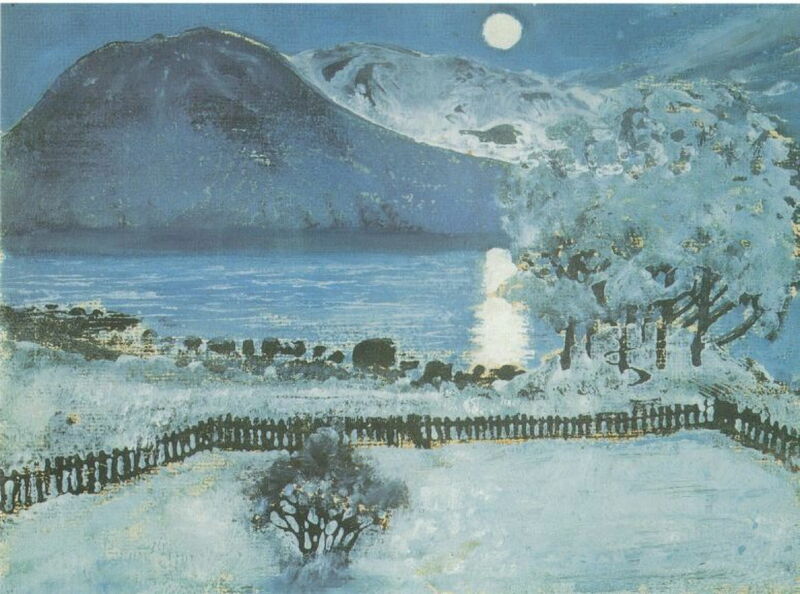 May Moon (c 1908), above, is one of many different versions of Astrup’s motif of the full moon reflected on Jølster Lake, seen from his early home on the north shore. Below is the winter version of the motif, in Winter Night (date not known). Nikolai Astrup (1880–1928), Winter Night (date not known), colour woodcut on paper, dimensions and location not known. Wikimedia Commons. Nikolai Astrup (1880–1928), Marsh Marigold Night (c 1915), colour woodcut on paper, 40.7 x 47 cm, Bergen Kunstmuseum, KODE, Bergen, Norway. Wikimedia Commons. Astrup’s early paintings of Old Jølster Farm and blooming marsh marigolds, for example in A June Night and Old Jølster Farm (before 1911), became prints such as this Marsh Marigold Night (c 1915). By this time his technique had come a long way, and many of his later prints were extremely painterly – to the point where it can be difficult to distinguish woodcuts made between 1920-25 of his Foxgloves painting from 1920 from that original, for example. There is more extensive coverage of his print-making and prints in the book cited below, which is a unique account of Astrup’s life and work, with many high-quality illustrations. I acknowledge its importance in my compiling this series of articles. 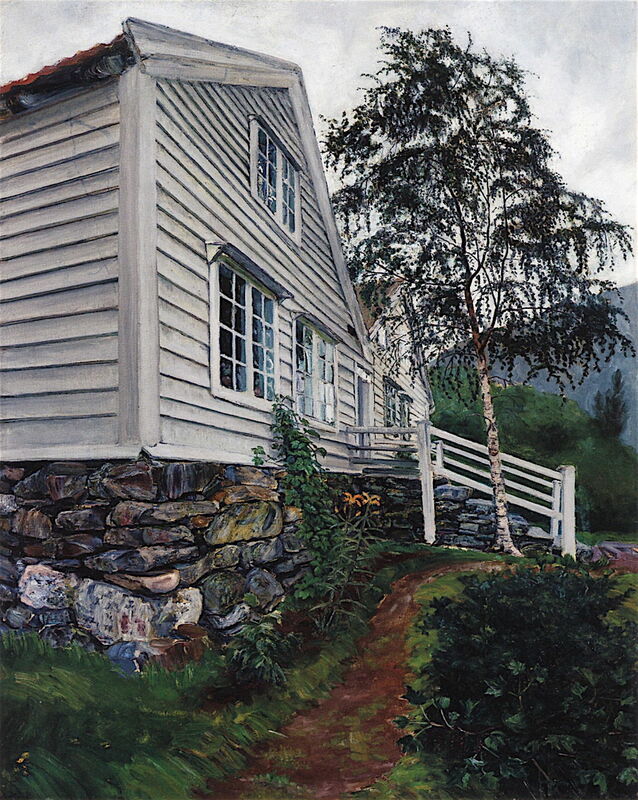 Posted in General, Painting and tagged Astrup, landscape, Norway, painting, prints. Bookmark the permalink. How reliable is About This Mac’s Storage tab?